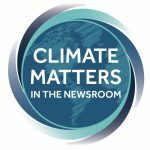 Climate Matters in the Newsroom (CMN) provides reporters with localized climate reporting resources and training. Supported by the National Science Foundation, the project aims to increase reporting on climate change science, impacts, and solutions. CMN expands and builds on the Climate Matters program that has helped hundreds of TV meteorologists become key sources of local climate change information. Since the 2018 launch of CMN 190 journalists have signed up to receive free weekly emails localizing climate stories and data to their media market. This is a unique opportunity for a select group of journalists interested in beginning or expanding their coverage of how climate change affects their communities. Submit nominations as soon as possible as selections will be made on a rolling basis. Self nominations are welcomed and encouraged. Decisions are dependent upon meeting the membership requirements of the Society of Environmental Journalists. Review SEJ’s membership eligibility requirements at www.sej.org/how-to-join-sej. Climate Matters in the Newsroom is a partnership between George Mason University, Climate Central, Climate Communication, National Aeronautics and Space Association (NASA), National Oceanic and Atmospheric Administration (NOAA), American Meteorological Society, Radio Television Digital News Association, National Association of Black Journalists, National Association of Hispanic Journalists, Society of Environmental Journalists, and The Carole Kneeland Project.